Short-eared Owls are about 38cm long and have a wingspan typically 100cm. They have roundish heads and tiny 'ear tufts' that are often very difficult to see. These fluffy tufts are nothing to do with the hearing organs of this owl (nor indeed of the other members of the Asio genus). Strongly streaked and spotted in dark brown on buff, Short-eared Owls have whitish faces with dark bills, and there are very dark eye patches around their yellow eyes. The young bird seen in the picture below is only a month old; it is fluffing out its feathers and spitting in a defensive display. 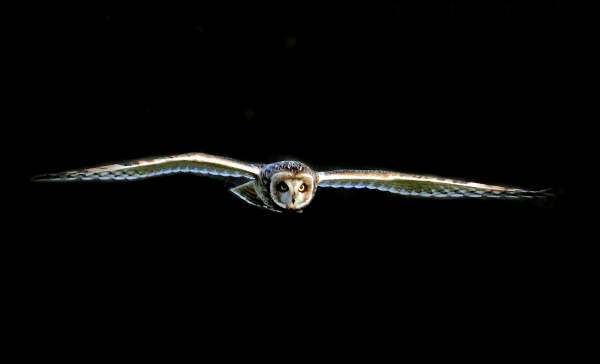 These predatory birds are year-round residents but not so plentiful as the other owls found in Britain. Their nomadic behaviour makes it difficult to assess accurately their numbers, but there is certainly also a significant influx of winter visitors to Britain from Scandinavia. 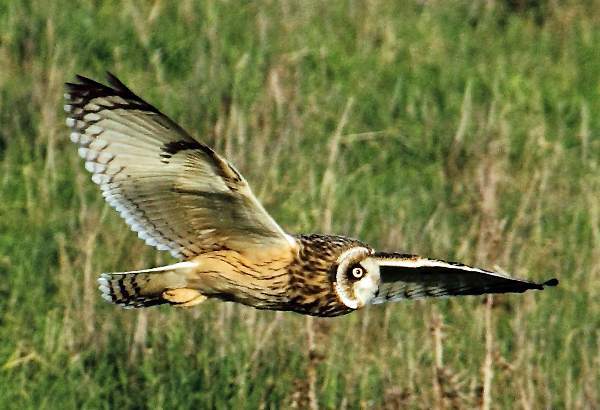 Birds of the open countryside, Short-eared Owls can be seen throughout Britain and Ireland. Their breeding grounds appear to be contracting northwards and are now mainly concentrated in northern England and Scotland. The distribution in Wales is somewhat erratic, but the island of Skomer is one place where Short-eared Owls can usually be seen flying by day and at dusk over the short windswept vegetation. Elsewhere the Short-eared Owl is almost a 'worldwide' species, occurring on all continents except Australasia and Antarctica. Making a rudimentary nest in a scrape on the ground, the Short-eared Owl lays a clutch of usually four to seven smooth white eggs between March and May. 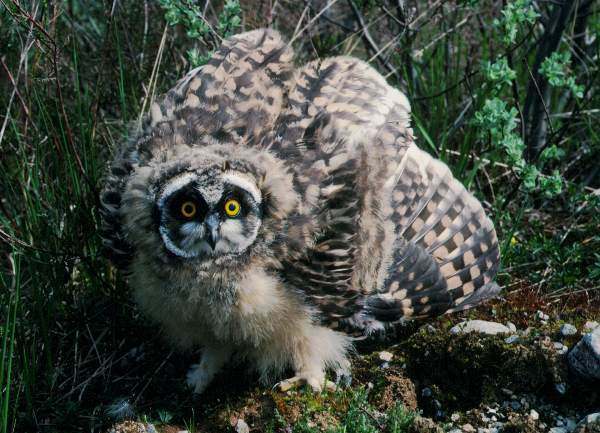 Short-eared Owls may produce a second brood in years when food is plentiful, and they defend their eggs and young, attacking predators (including humans) with notorious ferocity. During the incubation period and for the two weeks that the young remain in the nest, the male brings food back to the female, who also then feeds the young. The owlets are fledged and begin to fly after about four weeks. The Short-eared Owl population fluctuates from year to year depending on the availability of food, mainly field voles, but because of an assessed decline in its numbers in recent years the Short-eared Owl is on the Amber List. BirdLife International (2012). 'Asio flammeus'. IUCN Red List of Threatened Species. Version 2013.2. International Union for Conservation of Nature.